That is the way Catherine of Siena, the fiery young Dominican of the mid-14th century, might well have chosen to introduce herself to readers today. 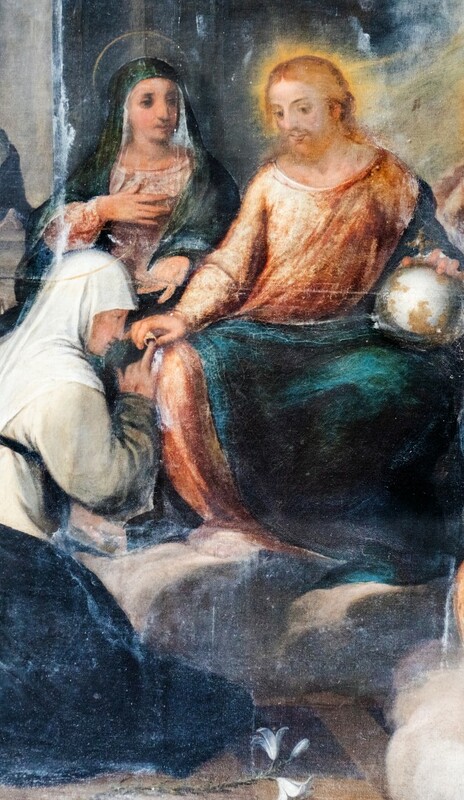 It was typical of this Dominican saint always to think and speak of herself only in connection with Christ and to present herself that way to others. For Catherine, as for Dominicans before and after her, “communication” was all-important; the single most important communication was Christ: with Him and of Him. Who was this woman, and why does she still have the ability to communicate with us, even today? Catherine was born in 1347 in the Italian city of Siena. The twenty-third of twenty-five children in a loving Catholic family, Catherine realized, even at a very young age, God’s call to give herself totally to Him. Having known the Dominican friars of Siena from childhood, she herself felt drawn to live the Dominican life. At the age of 16 or 17, she joined a group of Dominican laywomen who lived in their homes while dedicating their lives to prayer and active works of charity. Though Catherine’s family at first opposed her wishes, and the sisters themselves thought her too young to persevere, Catherine steadfastly grew in her conviction that God had called her to be a Dominican. Catherine’s first years as a Dominican were spent in seclusion in her family home, where Christ formed her in the “communication skills” of deep prayer and conversation with Him. Fired with His love for her and her love for Him, Catherine then prepared for an active life of service to others. As the years went on, this service took the form of caring for the sick and poor, nursing plague victims, and counseling others who wished to grow spiritually. Gradually, the Lord let Catherine know that He wished her to bring her spiritual communication skills to bear on the political life in her country. This she did, growing at the same time in her own prayer life. Finally, the Lord gave Catherine the task of influencing the Holy Father, Pope Gregory XI, to return to Rome from France, where he and the papal court had been residing for some years. This was perhaps her most difficult and painful mission, but always she was motivated by her love for the Church along with her profound respect for the Holy Father as the Vicar of Christ. Catherine died in Rome in 1380 at the age of 33, having spent herself completely for the good of the Church. Dominicans today are called to communicate the same urgent truths as did St. Catherine of Siena: That we are made for eternal life, that the desire to know God is our deepest hunger, and that love for Christ and His Church should be a fire that burns in us. Because she loved Our Lord, Catherine loved His people. Her example of active zeal fired by contemplation continues to stir the flame in Dominican men and women even today.